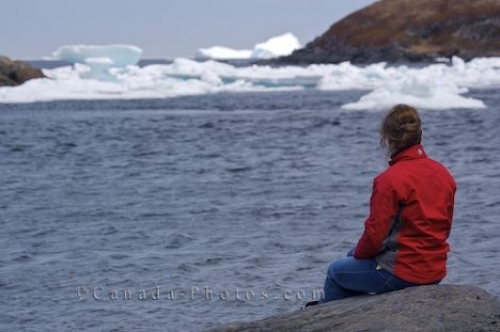 Sitting atop a large rock on the coastline of the town of Quirpon, Newfoundland, this woman takes in the beautiful scenery of pack ice and icebergs. The shores of the town of Quirpon is an excellent area to spend some time iceberg watching. The harbour can be surrounded with pack ice while large icebergs float past the harbour continuing on their long journey. Picture of a woman spending some of the day iceberg watching from the shores of the town of Quirpon in Newfoundland, Canada.